Silicon is a major (naturally occurring) trace mineral in our body. It’s beneficial for strong joints and connective tissues, vibrant skin, hair development, etc. Silicon is present in the human body as derivatives of silicic acid or of silicate compounds/ions. Important food sources of silicon include onions, oranges, raw cabbages, cherries, cucumbers, apples, carrots, pumpkins, peanuts, almonds, as well as unrefined cereals and grains. Deficiency of silicon could lead to symptoms such as; brittle nails, wrinkling of skin, weak bones, and thinning of hair. Silicon plays a vital role in balancing calcium and magnesium in your body. Without proper harmonious chemistry between these two, your bones and muscles could be thrown off balance. This could result in abnormal muscle behavior, such as constant trembling that could be pretty much uncontrollable. When it comes to bones, they would get a lot weaker and therefore you would be more prone to fractures during physical activities and even when mere walking. Magnesium not only plays a major role in the contraction of your muscles but also regulates many biochemical reactions in the body. Without enough magnesium intake, calcium cannot function the way it is supposed to. Calcium is responsible for the density of your bones as well as the health of your teeth and nerves. If calcium is in an imbalanced ratio to magnesium, it could affect certain hormones which regulate numerous body activities. Silicon stabilizes both elements to optimal levels as well as keeps your muscles and bones strong and healthy. It makes it easy for your body to facilitate calcium. Collagen is what keeps your eye structure in place and your skin unwrinkled. Collagen is the most abundant protein in mammals and constitutes from 25% to 35% of the whole body protein content. It slows the process of skin aging, improves the health of hair, teeth, nails and supports the process of tissue regeneration. Silicon improves the production of collagen by as much as 50% and helps in binding water for better hydration. Nowadays, we are exposed to millions of harmful substances. One of them is aluminum. Some studies show that people exposed to high levels of aluminum may develop neurodegenerative diseases such as Parkinson’s disease or Alzheimer’s disease. Silicon, by its unique properties, acts as an antidote to aluminum and prevents the further absorption of this element. According to Dr. Theresa Dale, silica together with sulfur has a tremendously positive effect on your skin and nails, making them look young and beautiful. Dietary silicon could lead to a nice boost for your immune system. Silicon functions similarly to how nitric oxide functions with respect to the immune cells. It helps to activate phagocytes which fight off toxic particles, and are essential in getting rid of infections. Silicon is a natural part of tissues and blood. From examinations that took place on multiple patients, it is known that low levels of silicon are closely related to calcification of arteries. While it is suggested that silicon helps inhibit the stiffening of arteries, there have been positive reports that silicon does help in healing osteoporosis, which has a direct link to the calcification of arteries. In addition, it has also been suggested that silicon makes the artery walls more pliable. 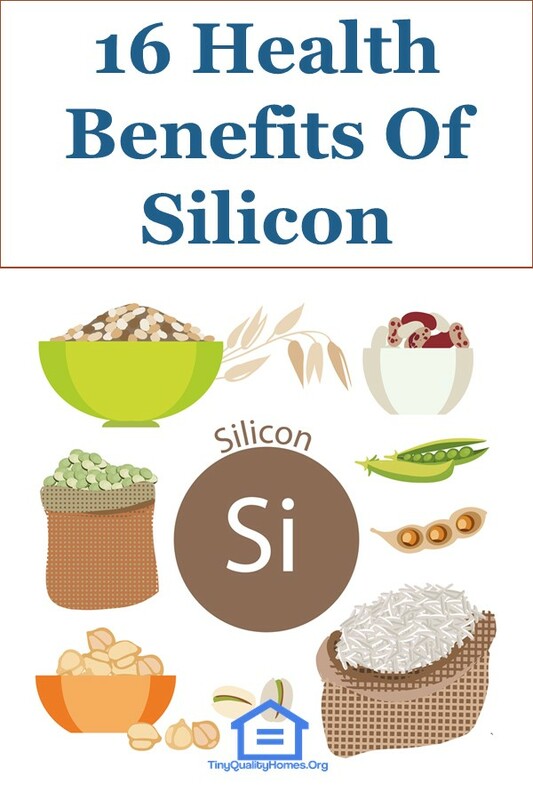 Silicon is an important element that supports all connective tissues in your body. It contributes to bone structures and the whole skeletal system by making your bones gain density and strength, which is necessary for proper movement. It also helps in healing osteoporosis. It is often suggested by doctors to use silicon in cases of kidney failures, as it helps the secretion processes and enhances the kidney’s ability to deal with toxins and wastes. Because silicon removes toxic substances from cells, enhances pliability of blood vessels, as well as seals and strengthens capillaries, it is often used for treating asthma. Silicon is very helpful in the healing process of asthma as well as in alleviating the symptoms of asthma. Silicon plays a big role in restoring a general balance in your body. It removes formations of plaques in your blood vessels making your cardiovascular system clean and unclogged. This prevents numerous cardiovascular diseases, such as hypertensive heart disease. Together with enhanced kidney secretion, as well as better immunity and inducement of its expectorant property; it is highly effective in detoxifying your body. According to the recent research and close investigation on beneficial aspects of silicon, it’s being suggested that because of silicon’s unique properties and widely beneficial effects; it’s effective against atherosclerosis, various types of cancer and even diabetes. Because silicon deficiency seems to be a common problem due to poor diet, it is highly recommended to undergo special tests and determine whether or not you are in need of supplements or dietary change. It shouldn’t be a big problem to fill the gaps by supplements. Ensure you consult your doctor or medical practitioner before taking any supplement. Porous silicon could also serve as an effective mechanism for drug delivery. A significant, yet often overlooked, benefit of using silicon is its ability to bond with heavy metals. This reduces the amount of damage caused by these heavy metals in the first place and further inhibits any ongoing harmful effects by neutralizing the heavy metals. Silicon slows the process of hair deterioration. It helps rebuild hair roots as well as makes them strong and flexible. According to research whose primary scope was to observe silicon’s effect on women’s hair; it has been proven that silicon makes the hair strong, elastic, thick and dense. NOTE: Women from various countries, from all around the world and from different age groups were chosen for the testing. The test lasted 9 months. Because silicon is generally good for your skin (silicon helps hydrate, smoothen, and keep the skin vibrant), it has the ability to expedite the process of healing most common acne. Furthermore, silicon’s anti-inflammatory properties only add to its usefulness and overall health benefits. Silicon participates in several major metabolic processes especially processes involving calcium, sodium, chloride ions, zinc, and fluoride ions. Without healthy levels of silicon in your body, it’s very difficult to assimilate essential microelements into numerous body processes. Silicon helps keep the nails strong as deficiency of silicon could lead to brittle nails. Ensure you consult your doctor or health care provider before taking any supplement. Furthermore, pregnant women, nursing mothers, and people who have undergone gastrectomy (stomach removal surgery) should avoid silicon intake.